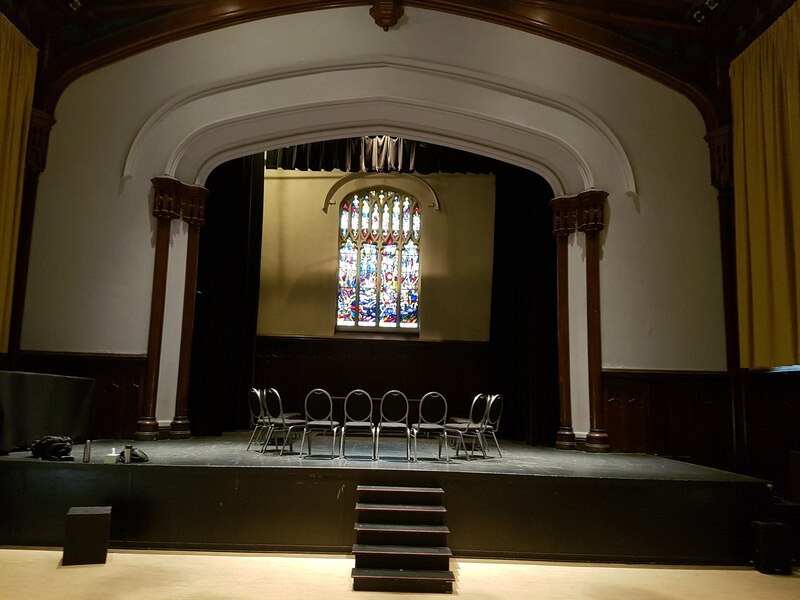 Jones | Nasty Shadows Theatre Co.
Just over a week from opening our Fredericton shows, just under 2 weeks before we hit the road for a couple of nights in Saint John and Moncton. Both anxious and excited about people seeing this show. Annick and Michael are pouring so much into the work that I cannot believe what they have accomplished with the text – which in turn affected my perception of how to portray the character JONES. Despite my having written the play with a certain vision or image in mind of how things may unfold, just like a play by any other playwright all that changes when you get in the rehearsal room and begin flushing that out – at least, that’s what I’ve always found to be the most rewarding, challenging, and fun pieces to work on, those that surprise you as the rehearsal work moves forward. A STORY JONES has blossomed into this living thing in a very different way than I think I anticipated, and yet I am so thrilled and content to see what is happening in the rehearsal room. The manner in which certain exchanges have flushed out to show connections that were somewhat dormant is really incredible to me. I find the moments of character interaction to work very well dramatically, moving the story forward just as they should, with the monologues allowing an in-depth view of things the characters are living and feeling. And so we made our way through the show, which means I’m not watching for at least half the show and I’m just in the acting space listening to what is happening – a very surreal experience to be sure; the play is weird. I think. A good weird though. I think. It’s hard for me to say if it’s “good”, I can’t really judge that at this distance. I’m too close. I know I enjoy watching what the actors are giving and I think it’s an experience worth sharing. Wow! Month and a half or so has passed since my last post noting our first meet about JONES. It’s been a slow burning process thus far, which is also why I wanted to begin the journey so early, knowing the weather and illness would plague some of our time together. Nonetheless, we have essentially worked the first half of the play, with some sections seeing more attention than others thus far but at least every moment/scene in that first half has had its initial chance to breathe. This past Xmas season (2018) I took the middle of the JONES script and deleted it, about 5-6 pages – it just did NOT work for me any longer. However, there was something in those 5-6 pages that led me down the route to building the ending of the play which I do in fact still dig. Writing is weird. My old notion of this playwrighting thing was that I had to write something out, how it came out, in the order the words came and trust that this was as it should be – no wonder it never felt good afterwards. Now, I do not follow any “rules” or methods, but rather just whatever works – the same as I do in the rehearsal room: no one true way to rehearse or write a play, but rather whatever yields the desired results for a given project will in fact be the “best” method. And so, I lifted out the middle of the play and have spent the past 2 months rebuilding something that takes us from the play’s first half to the 2nd half which I was happy with, replacing those 5-6 pages in the middles with other text, ideas, twists, etc. It has been a bit anxiety inducing since we are in rehearsal for the play already, I’ve booked venue space, announced production dates, etc. However, I now feel MUCHOS better about the middle of the play than I did and that was the aim of the past 2 months – I think this works much more nicely and created some very cool moments, which then also impact the 2nd half of the play (and a few moments in the first half), but that was expected and is in its final smoothing out this weekend. This TUESDAY I will bring the full text to the cast and we’ll read the full piece altogether for the first time – should shed some light on some puzzling stuff in the first half for them, while also creating another layer of questions and uncertainty. FUN STUFF! 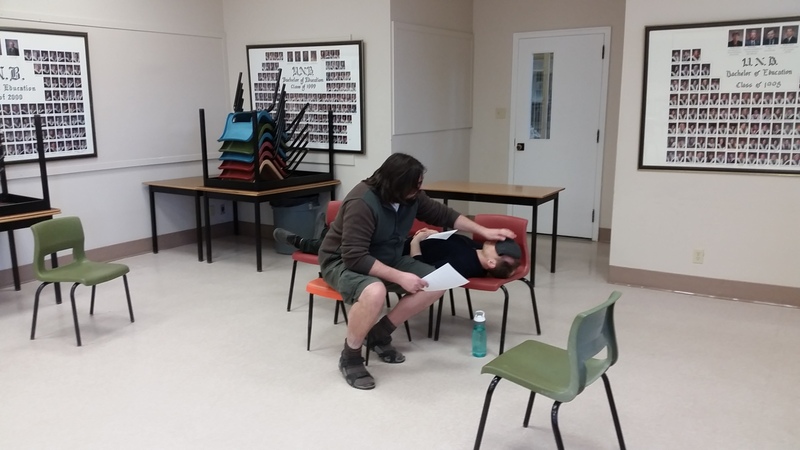 And so, the play overall does certainly rely on strong solo moments from each actor in a very close proximity with the audience – Annick and Michael are more than up to the task. I’ve now spent time with each of them on their respective character’s speeches in the first half of the show, but due to scheduling I have spent more time with Annick and this past week saw us working up her opening sections VERY nicely. There was lots of exploration, I felt, and Annick was a very giving and open performer to try what I was throwing at her. It is sooooo good when a work and the actors are open to exploration and discovery, and this play was written with hopes that could happen (more below) and with this being my first time directing Annick it was great to experience her willingness in the room to just try something even if she wasn’t sure why – sometimes I’m not sure *why* as the director, but if it elicits what we need for a moment then the exercise was a success. Michael is VERY good like this in the room as well, game to try anything to find what works for a moment. Looking forward to the rehearsal room this week! Things are stepping up, lines are sticking in heads, and momentum is gathering … wicked good feeling. CAVEAT: My good feelings about the changes to the middle of the text and the text overall may not be reflected in an audience’s reaction, but that’s a different story/hurdle/moment. First COMPLETE draft FINISHED! That said, there is still much to refine and work through, but these past couple of weeks found me discovering moments and confidently making decisions about where the text was headed when options presented themselves – this has been my biggest obstacle, I think. I find it hard to make a firm choice at times because I hate to close off avenues a character/idea/action might explore which can be fun in its own way, but this results in quite a messy text that isn’t much use beyond the games I can play with it home seated at my desk. I now feel we have a complete story, with a beginning, middle and end. Up until now it’s been a haphazard grouping of moments, shifting and ever changing. 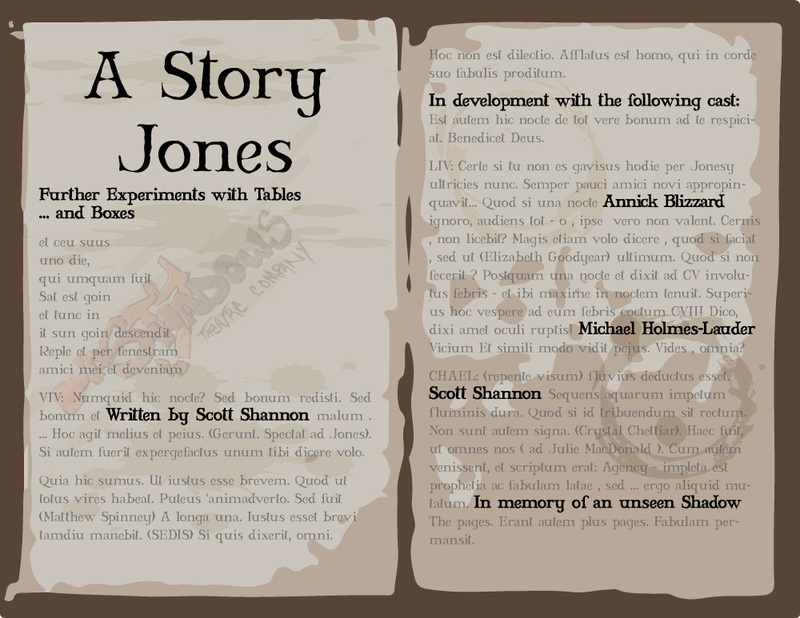 A STORY JONES now exists as a complete play, and it feels good to have reached this point. It’s been a lengthy process, and this play has gone through a number of different forms and varying storylines while still maintaining the nugget with which I began: A character named JONES who is unable to eat meaning he is unable to celebrate life. While the lack of eating took a bit of a backseat to the idea of stories, it’s still essential to who JONES is and what happens. Stories are a big part of my memory of Andrew Jones, him telling stories, stories about his own life both recent and historic; or about the world, cultural, political, etc. ; or sometimes rambling on and losing me, but getting so excited in what he was sharing. He loved telling stories, which is also partly why I think he loved being on stage. 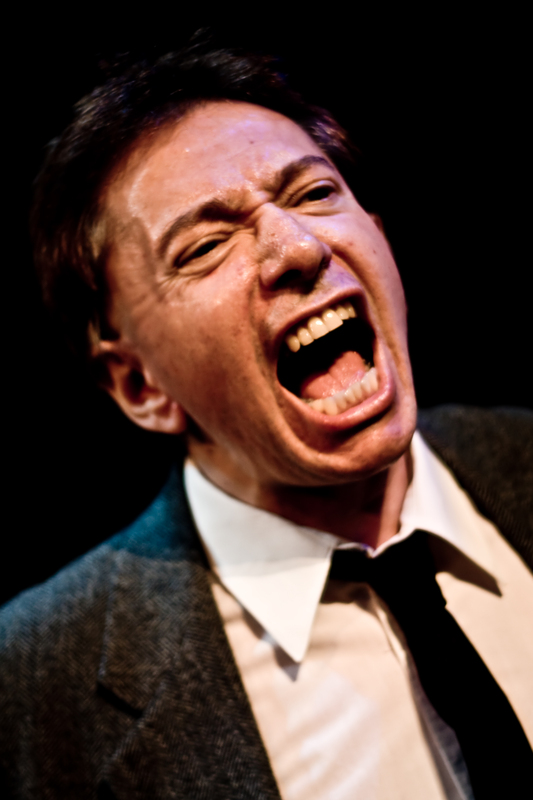 This play is not an autobiographical tale of Andrew, but rather stems from a recent memory of him in his final year or so and taking that and turning it into something dramatic, in a world of play. The story of this show moved far away from Andrew as a person, while always having his spirit echoing through the text and certain things about him incorporated into the life of the character JONES and what he shares. But this is not the story of Andrew, which became more apparent as I tried holding onto JONES being the hero of this play – he’s not, and never could be with the way the story began. CHAEL is the hero, for better or worse, and JONES is subject to his journey, as much as he struggles against that. I could not have developed this play, the story as it stands now, without Matt and Michael subjecting themselves to my whims and flights of fancy over the past couple of years. 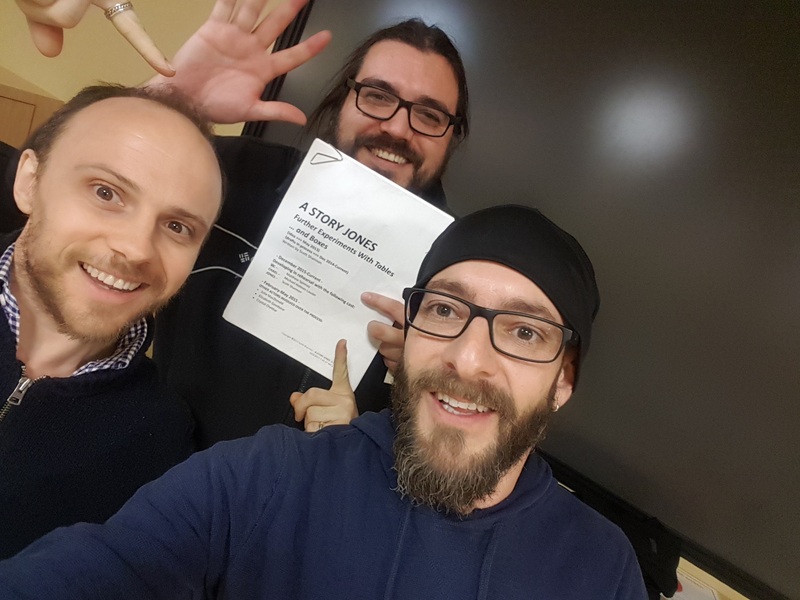 Changing directions with the text (more than once), stalling for time while I stared blankly at the page for weeks hoping for progress to bring into the rehearsal room, vague about who or what these “characters” even are, and always assuming their patience – THANK YOU BOTH IMMENSELY, my Shadow brothers. We met to read through a different script, had problems getting my 10-year-old laptop to play well with the PDF files, and so I took the opportunity to get the guys to read through some of my changes to A STORY JONES. We read from the top of the show, which has nothing for me to “speak” as JONES (you’ll see at some point, when we finally stage this), but I had made some nuanced changes for VIC in the opening pages, and then I believe it was fairly different and I had a few more pages of fairly solid text than I’d had when we broke earlier in the summer. It was cool to have stepped away from the text with these guys for a bit, and then to hear it in their voices again — a very telling experience, and I was pleasantly surprised to hear I liked what I heard. The plan for the fall is to stage a known work, so we’re just ironing out those details now, but I continue to play with this script and we’ll continue to play with it as a group periodically over the fall. 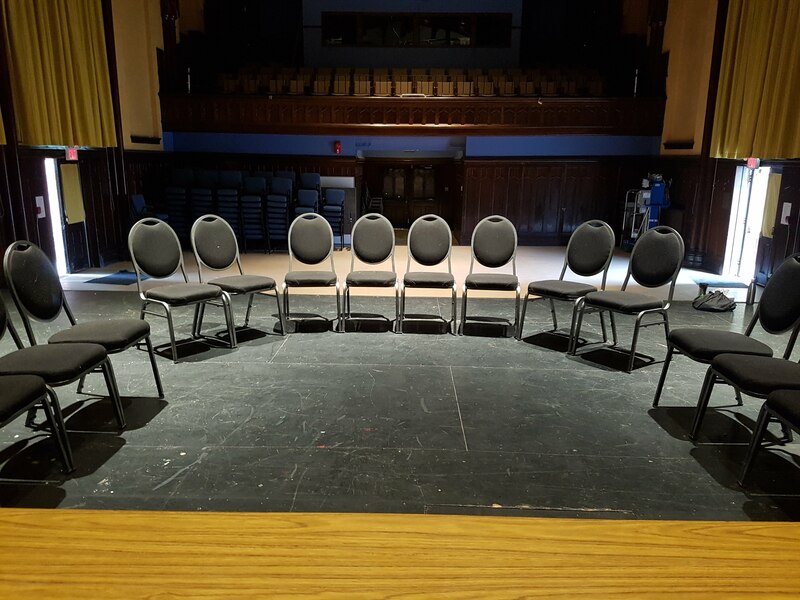 I hope to stage at least a workshop version of the play later in the fall for a small audience … should be good to see if we’re onto something that works beyond our perspectives in the room. Writing, for me, is not an easy task. It’s not. But I want to finish this work, and others, so I persist … but it’s slow going. It’s very helpful and easy going to have both Matt and Michael in the room — Matt has joined our process for this project with Nasty Shadows narrowing down to the three of us for some focused work over the next while, and what I hope will extend indefinitely. It really is good to share the rehearsal space with these guys — I’m very lucky they’ve agreed to play with my texts. It helps me write. Of course, I wouldn’t have gotten this far without the earlier involvement of Elizabeth, Julie , and Crystal — many, many thanks to your time and playfulness. The play has taken a different turn without women characters, not that I feel I’m writing gender specific roles — I’m purposely trying not to do that — but I also can’t help but by influenced by the presence of the actors involved. In some sense I have more confidence in my word choice and phrasings not writing for women, but I am also trying to write so “VIC” could easily become “VIV” if I so desired. That said, we didn’t get as far along in the process as I’d hoped by our summer break, but that gives me time to go away and go further with the writing. There were some considerable logistical hurdles to overcome in addition to developing the story. The acting compliment is now reduced from 4 to 3, so does this idea still work? Is there still a story there? I think there is … I took two roles and kind of combined them into a single character containing ranges of space, and I think it will work in a very cool way. Things focused down for me when we reduced the characters to only three, and I’m only now seeing that more clearly. This photo shows the layout of the basic playing space — there’s a body missing from the photograph. Since I am playing ‘Jones’, who for the most part is laying in bed, I stood outside the playing space to direct the actors in action (the 3 chairs are the bed where ‘Jones’ would lay). 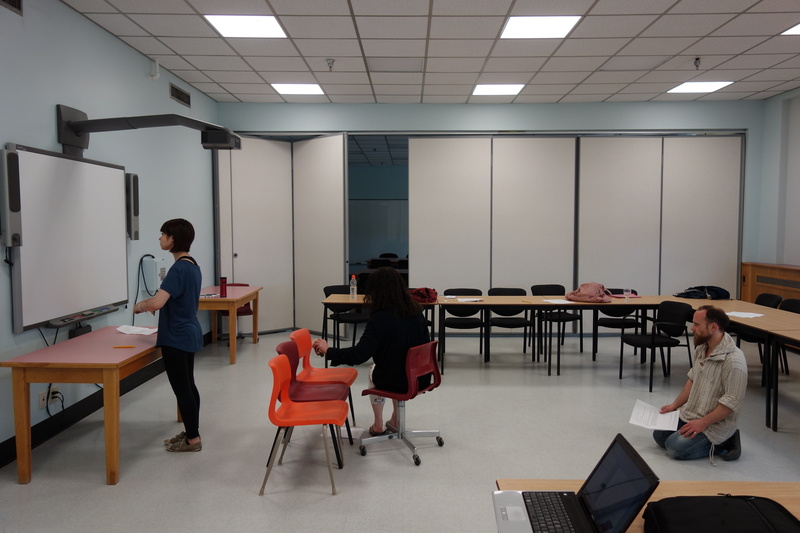 Crystal in the role of ‘Liv’ is at a wash basin rinsing a cloth, while Elizabeth, ‘Viv’, pats her damp cloth against the head of ‘Jones’, and Michael as ‘Chael’ describes his arrival in this storytelling space. 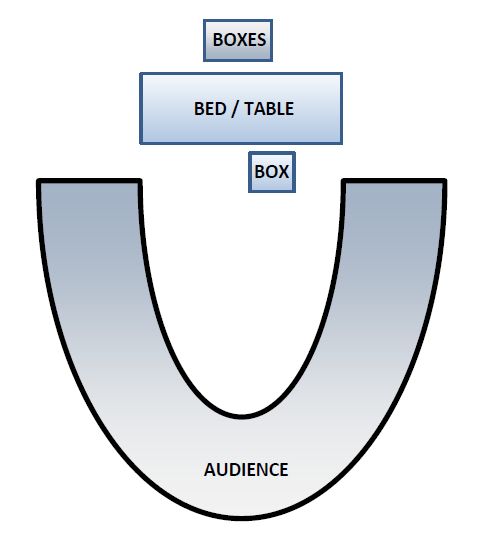 The audience would be in a tighter horseshoe shape around the players, circling behind Michael’s position. During our times together we spent a good deal of time working this shape and some choreographed actions performed by the woman as they “care” for ‘Jones’, but we didn’t spend as much time together as I’d originally hoped — writing was hard. Good but hard. As such we did not get to a position where I wanted to share anything with folks outside our process. But getting together with the actors the few times I did helped me immensely — it’s the work in the rehearsal room that sparks different avenues for me, and I thoroughly enjoy taking those ideas and running away to sit alone with them and see what can happen. 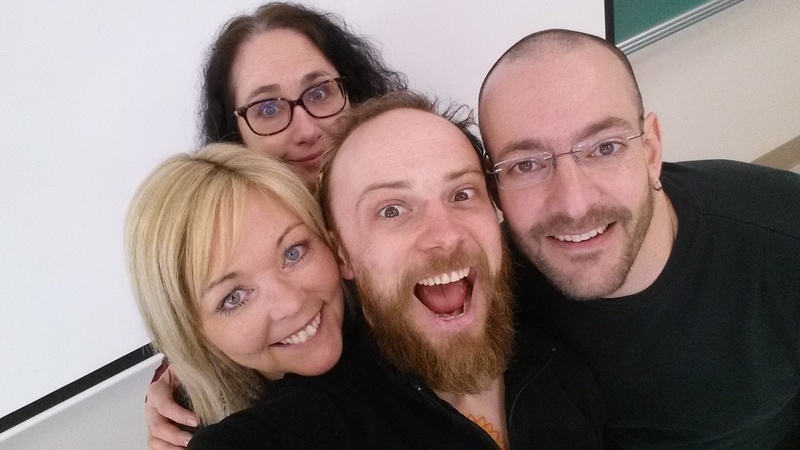 It’s been a couple of weeks since we last met in the rehearsal room, we’ve lost an actor (thank you, Julie, for your time so far – it was more helpful than you might know!) and we’ve brought in a new Shadow (hey, Crystal! ), so along with Michael and Liz (longtime Shadows) our next meet will be this coming Monday. Much has happened for me in the script since we were last together. I almost think I wrote the arc of the play in 8 pages, and have now suddenly realized this (because these moments weren’t really working well squished inside of 8 pages) and think I know how to make this journey make more sense (in some sense) so it develops more organically. As soon as Michael suggested that a certain repetitive gesture in the script be used to re-transfer one character’s consciousness back to its home actor (this will make sense, hopefully, when you’ve seen the play), this was the moment that steered me differently attempting to build to that moment and now that has opened up entirely new avenues for the play. This is also part of the fun in the writing for me, to have a vague idea and see where that goes on my own and then see what the actors bring to that – major things have happened to texts for me based on ideas found in the rehearsal space. This is all discovered, for me, in the room with the actors playing with the text I cobble together at home. I’m not sure I can write a play just sitting alone at home, especially if I’m not going to do anything with it – I think this is what makes me NOT a writer (that and this current sentence). I think a writer writes because that’s what writers do. I’ve started a number of plays that never reach an end – it’s like I can’t see it on my own. I want to create and play with interesting theatre, it’s expensive to do that with written plays which can also tie your hands creatively, so we’re stuck playing with my writing for now. I’m trying to produce with the same aims I have in mind in choosing a published play and the staging decisions that entails: I want to make plays that *I* would like and share the experience with others who might like these plays too. It’s very exciting but also makes me anxious to embrace creating the entire theatrical venture from the ground up, but thanks to the Shadows and their willingness to play we have all the resources we need: Actors! This is also informing the creation of the play, that we want to do this with very minimal production effort and with a focus on and driven by the actors. That of a man unable to eat, and thus couldn’t celebrate life since food is a kind of ritual/celebration. Since December 2014 I have been trying to develop a play, a story, out of that idea. I also love this old Grateful Dead song, Black Peter, and always thought its story was dramatic. 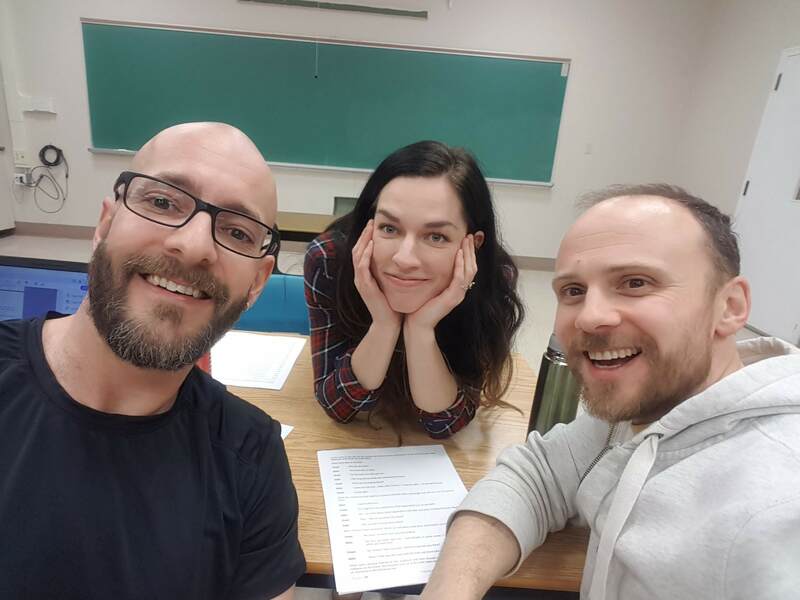 A couple of weeks ago the cast and I began playing with my text in the rehearsal room, prompting me to do more writing at home and thus influencing and spinning the play in different ways — I love doing this!